By the time Mickey Hart finished his AARP convention appearance in New Orleans yesterday, we had quite literally seen his brain on drums as his brain waves were projected onto a screen by neurologist Dr. Adam Gazzaley through the magic of electrodes and computer modeling. 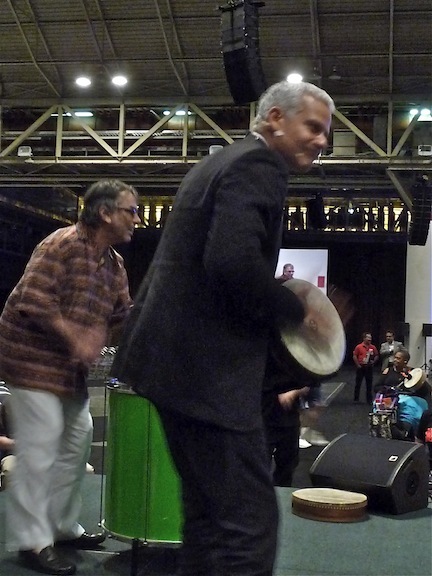 Hart then led the audience in a 1,000-piece drum circle until it felt as if the roof was going to vibrate off the convention center. The National Association of Music Merchants hosted Hart's AARP session to demonstrate the interplay of rhythm on brain function, which ties in with the legendary Grateful Dead drummer's longtime focus on the healing power of music and mental health. He shared the story of his grandmother's fight with Alzheimer's, and how years after she had stopped speaking he picked up a drum that was in the car, started playing it for her and she said his name. "It all comes down to the vibrations and rhythm of things and how they interact, and now we have the real science," Hart says of his collaboration with Dr. Gazzaley on music, memory, attention and aging. "Before, it was anecdotal. But every musician knows it works. When you get off the stage and your consciousness is elevated, there's a whole different kind of priorities in your body. We've never really been able to see the brain on music." It's just the beginning as far as Hart is concerned. "I've been working in my field for many years and so has Adam, so it's a handshake between science and art." Dr. Gazzaley and Hart addressed an AARP conference that is increasingly comprised of baby boomers looking to stay mentally healthy as they age. Mary Luehrsen, Executive Director of the NAMM Foundation which funds music / brain research and music education initiatives, spent the weekend encouraging attendees at the music-making pavilion to pick up an instrument and consider, post-retirement, getting the proverbial band back together. "They come in and try a ukelele, a drum, they try out a guitar, and it's so helpful to us to see that the message we're bringing out to the world is needed," Luehrsen said. "People want the information. They want to be validated that it's okay to try. It's something they should remember that they can do." KB: As the drum circle reached its peak, you started telling the crowd about Congo Square. What did hosting the session in New Orleans mean to you? MH: That's where it all started here in the West, Congo Square around the 1800's when the slaves were allowed to play their instruments on Sundays. Because the very, very, very powerful rhythms were the center of their whole life, their whole being, so taking away their instrument was a way of enslaving them. They couldn't practice their songs and their religion. Eventually the upper class whites, they would actually come and view it and observe it as kind of an entertainment But slowly the instruments got back into the hands of the people and it spawned what we know as American music. The stride piano, the blues, jazz, big band, bluegrass, rock and roll. So it was the catalyst, it was the birthplace. That's where the seed was planted in Congo Square. Actually we're going to go over there and play this afternoon. KB. That's perfect. This spring Dr. John was in a drum circle in Congo Square with Native American Elders from around the country. They marched down to the river with pedicabs for the elders, and held a healing ceremony for the waters. MH: What a great guy. I played with him once, we played at a wake. Me and Jack Cassidy from Jefferson Airplane and Dr. John. We played the wake of a Digger, he was one of the founders of this free food and all this kind of stuff in San Francisco. It was 1968, I believe. That's the only time I ever played with him, in celebration of this guy's death. We celebrate our dead, bring the babies into the world -- music accompanies us through the whole life cycle. KB: What are some goals projected to carry on from your collaboration -- where's it going? Dr.G: I think there is tremendous potential to couple the rigorous approach that we use in neuroscience to understand the brain, how it's plastic and changes to the environment. How we might be able to use the lessons that exist in the world of music and rhythm to influence health and quality of life. So I think there's a tremendous amount of potential. I come at it from two ways, I have an appreciation for music and read Mickey's book 20 years ago and really love rhythm, independent of neuroscience. And from the world of neuroscience, we now have a very clear appreciation that the brain works on rhythms itself. And so understanding the rhythms of the brain is a very strong motivation of my laboratory. So now coupling them together is really exciting. And that's something that this relationship has now fostered. Now that I've talked to my laboratory about this and told them what Mickey and I are doing and what we're going to be presenting, there's so many people stepping up and wanting to be involved. The same thing with my colleagues at UC-SF. They're adding, 'Rhythm's important in my work, I study learning and plasticity and sound.' And so now all of a sudden my colleagues are all interested and they study memory. Everyone can make a connection over the power of rhythm. I've seen it over the last several months Mickey and I have been working together. When I talk about this, I see that happen all the time. So for me I like the new energy and excitement of bringing these two worlds together, and it can be in many different ways. KB: Anecdotally, almost everyone has a memory and music combination with a loved one, it seems right that it's coming into scientific scrutiny. My parents both passed from Alzheimer's, but my mom could belt out the "Hello Dolly" refrain right up until the very end. MH: Everyone has that kind of story, or different story with the same outcome that rhythm, vibration have something to do with it. Everyone has a different take on, it but once you think about the rhythm of things it makes a lot of sense in a lot of different professions. Of course, this is a no-BRAINER. Laughter. KB: Do not make me put that in a headline. MH: Perhaps I digress. But the important thing to know is that vibration and rhythm is the essential part of our existence as humans. So it's all kind of making sense, we're connecting the dots and as Adam says, the connections, because that's what it's really about. Connecting. All of a sudden you have meaning in your own personal life about the rhythm of things, how you go through life if you think of it in rhythmic terms. Some things you can't explain can be explained rhythmically. Like if you have a fight with your wife or your daughter or something, the way I look at is "We're out of rhythm, let's get back in rhythm." It's one way of casing this. And they go, "Okay, Dad." These are interactions that have movements Everything changes all the time, and that's a rhythm as well. So you can make sense of a lot of things that perhaps language can't explain. Rhythm is the basis of all things. KB: And it's ancient knowledge. The Autumnal Equinox finally fell today and it felt like, "Oh, thank GOD." MH: Well the ancients, anybody who's thinking about the world had to go through vibrations, they had to go through music whether it be Confucius, Pythagoras, Plato, Einstein. Where do you think Einstein came up with all those great ideas? He was a violinist, played a little piano. That was his greatest love. Not necessarily physics, but it was music. And music led him to his thinking on relativity and so forth, which was all about vibrations. Even though he worked in a small little patent office, music allowed him to travel outside and get way beyond his physical and mental state and to be able to realize the workings of the universe. And it all became very apparent after he played the violin for awhile. This is well documented. Dr. A: And to feed off your point before about that anecdotal evidence, that's a great starting point for science. As a scientist I love that, when everyone sort of gets it already, but it might be missing the kind of evidence we need to have to advance the field in a very powerful way. KB: What's interesting is that it's not considered as pertinent for late stage Alzheimer's studies, but in the demographic that comes to this conference, it's preventative. You do your crossword, read your books, but it could be accepted scientific knowledge that you interact with the rhythms of music. MH: Preventative medicine, this is what this is all about as well. DrA: It's challenging research because there are so many factors in someone's life, it's difficult to do controlled studies of this. From my read of the literature, that's one of the challenges so far is having appropriate controls to know exactly if it's music, even though we have that impression, and rhythm or things that are associated with people who also take music lessons. And the social aspects. It's likely to be multi-factoral in many ways, but that's what science does, it dissects it. And it might very well be that certain types of training and musical emphasis are more appropriate or have a bigger impact on some people than others and that's the kind of detail we can understand. Or how to approach rhythmic training in a most effective way. MH: Or what vibrations an infected brain has as opposed to a healthy brain. Sonically, what are we talking about here? Does the infected brain have more or less of certain frequencies? Well, that's my guess. My guess is by putting those frequencies in or taking them away you will have preventive medicine. DrA: And how to do that is such an interesting question. MH: We have the idea of what we're after, and we have some of the tools because the machines are getting smarter. The diagnostic tools he has now can tell what's deep in the brain without the contamination of the movement it takes to get that response. In the last few years, we're able to have the science to be able to reveal what we know exists. We just have to measure it. We just have to code it. It's about breaking the code, the musical rhythmic DNA. This is what's the beginning of, it's a rhythm genome kind of project which will yield all kinds of data and take us in many places that we can't even imagine now, but we have to know what we're observing. We have to be able to connect the dots. DrA: It wasn't long ago that the rhythmic aspect of the brain activity, is not just an artifact of how the brain works, like everything vibrates, but that it is a core fundamental aspect of what allows us to think and remember and pay attention. And that it is how our brain synchronizes and works as a network. That is only very recently that neuroscientists have come to really accept that as a community. With that comes the opening of so many doors, because it does exactly what happened today, it creates a bridge between larger rhythmic universe as Mickey describes it and the very function of the brain. So where that's going to go is big question mark and an exciting one, as it's really just happened. KB: You couldn't have picked a better city to kick it off. One of my our trumpeters who still gigs is Lionel Ferbos, at 101 years old. MH: This is the city of rhythm. This is where it was born. It's perfect. It was born here in the river, took it up to Kansas City, Chicago, New York and the world. This is the birthplace of American music. And the powerful rhythm that came from West Africa. We're very aware of the river, and Lake Pontchartrain because of the musicological connections. KB: The Milneburg camps, a birthplace of early jazz, were demolished at Lake Pontchartrain in the '30s. Maybe some of the rhythms are still coming up out of the lake. KB: Thank you both for taking the time to talk about this. I know you've got a lot on your MINDS. MH: Ouch! Like Soupy Sales used to say, 'My brains are falling out!' But this is so exciting, it really is. It's the most exciting frontier in music in this century. This is what music was meant to do, to be. It was medicinal at first with the shamanic traditions. Then it became entertainment, people paid money to see it performed. Then it became religion again with the church, different kinds of religious prayer. And now it's becoming medicinal again, people are understanding its powers. Now science is going to understand it. The practitioners, we knew it. That was easy. You always come off a stage, if you play halfway decently elated, elevated consciousness. It's elevating the consciousness, that's what music does. And it's so cost-effective. All you need is an instrument and some passion to be able to bring down the Gods.